Another day, another flagship smartphone - but the Huawei Mate 10 is worth paying attention to, and not just because it’s relatively cheap. 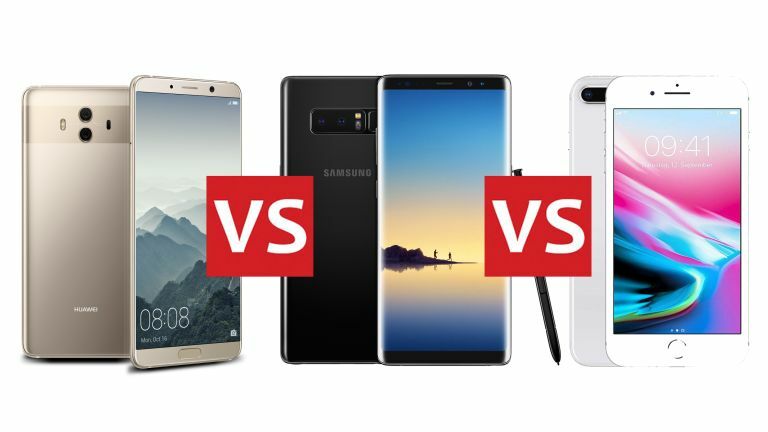 Its clever cameras, huge battery and AI-focused processor promise great things, but how does it compare to its biggest rivals, the iPhone 8 Plus and Galaxy Note 8? Let’s find out. The Mate 10 comes in mocha brown and pink gold, and from the back it’s a very premium look. Unlike some rivals (cough! Samsung! cough!) the proportions look right, with twin camera lenses, fingerprint sensor, flash and AF sensors perfectly positioned. It’s less impressive from the front, where it embraces the thin bezel trend but looks pretty much indistinguishable from, say, a recent HTC. The Galaxy Note 8 isn’t great at the back - it looks like a riot shield - but from the front it’s the belle of the ball, its edge to edge display curving where you’d expect a bezel and dominating the entire device. It looks and feels fantastic. The iPhone 8 Plus looks like a shiny iPhone 7 Plus, and while it’s pretty enough it’s looking dated. Rose Gold has been replaced with a new, slightly pinkish gold shade and the headphone jack has been sacrificed for water and dust resistance. The Mate 10 gets a 5.9-inch, 2560 x 1440 LCD; confusingly the bigger Pro model feels smaller because its display - an OLED, not an LCD - has a different aspect ratio, delivering 2160 x 1080 pixels across its six-inch screen. However, the standard Mate 10 display is sharper and its regular proportions are better for most video services. The Galaxy Note has gone for a wider aspect ratio of 18.5:9 on its 6.3-inch, 2960 x 1440 screen, which makes it less of a hassle to hold. It also enables Samsung’s Multi Window, where you can have two apps open at once: in a standard aspect ratio that feels a little cluttered, but it works well in these dimensions. It’s the best screen here and it works with the S Pen for scribbling. The iPhone 8 Plus is small in this company, with a 5.5inch Retina HD display with 1,920 x 1,080 pixels. It also gets Apple’s TrueTone display, which adjusts the colour temperature and balance according to ambient light. It’s hardly a must-have but we like it a lot. The Mate 10 has a Kirin 970 processor, 4GB of RAM and 64GB of storage, expandable via microSD. The Kirin processor is notable for its “Neural Processing Unit”, designed to improve AI processing in apps such as the Camera app. It’s an octa-core processor like the Exynos in the Samsung, and on paper at least its clock speed is very slightly slower than the Samsung - we’re talking fractions of Gigahertz here. UK versions of the Galaxy Note get the Exynos (some markets will get the slightly slower Snapdragon 835) with 6GB of RAM and 64, 128 or 256GB of storage. It’s a very fast processor, but in Geekbench benchmarks the iPhone 8 Plus absolutely destroys it with single core results of 4,211 (1,967 for the Samsung) and 10,102 in multicore (6,492 for the Samsung). Apple’s new Bionic processor clearly lives up to its name: it’s a desktop-class processor delivering screamingly fast performance, and it’s backed with 3GB of RAM and either 64GB or 256GB of storage. Huawei was shipping dual-camera smartphones while most firms hadn’t even prototyped any, so it’s hardly a surprise to see the dual-lens Leica camera in the Mate 10. Both lenses have an f/1.6 aperture for exceptional low light performance, and the resolution is 12MP for the colour sensor and 20MP for the monochrome one. The camera software is currently pre-release but initial impressions are of very clear, detailed shots while the automatic mode switching seems a bit flaky. The Galaxy Note 8 can’t quite match the aperture of the Mate 10 - its dual cameras have f/1.7 for the wide-angle lens and f/2.4 for the 12MP zoom lens - but the new Live Focus tool uses the zoom lens to analyse the background to produce SLR-style shots, particularly portraits. It also shoots a normal image at the same time so you’re not stuck with unsuccessful attempts. The iPhone 8’s power is in its camera software, which introduces some superb lighting effects in its SLR-style portrait mode. The camera setup combines a 12MP wide-angle lens with f/1.8 aperture and a 12MP telephoto lens with f/2.8 and optical zoom, and the True Tone flash offers slow sync for more lifelike flash photography. We’ll need to get back to you on some of the software: the version of Huawei’s EMUI 8 software that sits atop Android 8.0 Oreo has been designed with AI in mind, and promises to understand what you’re doing and recommend things accordingly - so for example if you’re reading an ebook you might be prompted to turn on Eye Comfort Mode for easier reading. We’re regularly disappointed by supposedly smart AI assistance in phones, so we’ll reserve judgement until we can test the AI over a decent period in the real world. The Samsung ships with Android 7.1.1 Nougat, upgradeable to Oreo, and the rebranded Samsung Experience - formerly TouchWiz - is sleek and streamlined, with good use of the display’s edges for shortcuts. It also brings Bixby, Samsung’s rival to Siri, Cortana and Google Assistant - although Bixby doesn’t cope well with non-US accents. The iPhone comes with iOS 11, in which Siri’s noticeably better than before: we’re spending a lot less time repeating ourselves or giving up on tasks and doing them ourselves. The OS isn’t dramatically different from iOS 11 but it’s refined and fast. The Mate 10’s battery is huuuuuuuuuuge: it’s 4,000mAh with SuperFast charging, but not wireless. The Galaxy Note 8 does do wireless as well as fast charging, and while a 3,300mAh battery seems small it’s a sign of Samsung playing it safe after the whole explodey-Note-7 fiasco. We’re pretty sure that the Note 8 battery will last all day without going on fire. Apple has the smallest battery here, but as Apple controls the OS and the chipset as well as the hardware it can optimise in a way Android firms can’t. The result is exceptional battery life, and in a massive group test by Phone Arena it outlasted every other smartphone (if you’re interested, the Xiaomi M6 was second and the HTC U11 third). Apple has finally added wireless charging too, with support for the Qi standard. The Mate 10 is the cheapest device here, with a €699 sticker price equating to £530 / $710 / AU$999. The Galaxy Note 8 is a lot more expensive: it’s £869 / $929 / AU$1499, although discounting is starting to appear. However, its RRP makes the iPhone 8 Plus seem cheap: it starts at £799 / $799 / AU$1,079. It’s too early to make a firm pronouncement on the Mate 10: its camera software isn’t quite ready and we haven’t been able to use its AI features in the real world just yet. However, it’s a very impressive device with a superb camera, a great processor and a huge battery, and it’s considerably cheaper than its rivals. If the software’s sorted it’ll be a seriously good smartphone. The Samsung, though, is even better. The screen’s an immediate win for us, the S Pen has many loyal fans and it’s an incredibly quick phone. It’s arguably the best Android device around, and one of the most expensive too. The iPhone won’t have Samsung owners jumping ship but in terms of sheer performance it leaves the other two flagships in the dust. The design’s a little dated although we can’t say we’re lusting after the notched screen of the iPhone X, but while the iPhone 8 Plus doesn’t look dramatically different from its predecessors it’s a wolf in sheep’s clothing.